I'm back! …or didn't anyone notice I was gone? Anyway, as I was not able to attend the Global Voices summit in Delhi (as I am still waiting for the approval for my Indian visa after three months), I consoled myself with a trip to my homeland, Kingdom of Lesotho. No, just kidding, I was off on a well-deserved vacation (if I may so myself, as no else would) to Pakistan. My days there were much prized perusing the wares of what the cities of Lahore and Karachi have to offer. Even had the opportunity to meet a lot of the Pakistani bloggers whose blogs I frequent and highlight in my post here at GV. But before I get into that, let me call your attention to the recent post by Teeth Maestro, who also happens to be the co-founder of the Don't Block The Blog campaign, in which he details a new solution to by-passing the blanket blogspot ban still in force in Pakistan. Having some problem surfing to blogspot websites with pkblogs I had resolved to try and find another solution, I went on a prowl for good solution after a massive hunt I came up with the idea of setting up a secure SSH tunnel in combination with FoxyProxy Plug-in on FireFox. 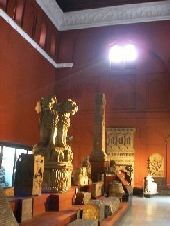 During this vacation, I had the opportunity to visit some of my favourite places, in Lahore, including the Lahore Museum. If you ever get the chance to visit Lahore, this place is a must see or else the authorities will not allow you to leave the city (or that should be the policy for all visiting tourists, if I had anything to do with it). The best part is for 10 Rupees they allow you to photograph inside the museum. I went ape, and took nearly 150 photographs. I shall open my own museum gallery exhibiting the photographs of the exhibits at the Lahore museum, and I shall charge only 5 Rupees to photograph my photographs. The Glasshouse points out another conundrum with his latest post. Over the years, I have had the opportunity to converse with several former foreign secretaries and senior ambassadors and during these conversations (some lengthy, some brief) I have habitually made it a point of asking each of them one simple question: Who has dictated Pakistan’s foreign policy over the past few decades? 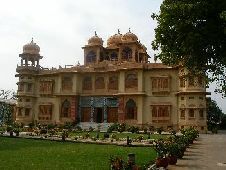 Another museum worth visiting is the Mohatta Palace in Karachi. Formerly the residence of Fatima Jinnah, the sister of M. A. Jinnah, the founder of Pakistan, the building was restored to full glory and now houses a museum dedicated to preserving the history of Sindh. No pictures allowed inside the museum, which is a shame, because I would have opened up another museum gallery displaying photographs of all the great exhibits. During my stay in Karachi, I was invited to a large gathering of Karachi bloggers. Coordinated by Teeth Maestro and hosted by Vintage Shop at her family's café Déjà vu, the afternoon gathering was spectacular with 20 plus prominent bloggers all getting together to talk incessantly about everything imaginable, including my choice of footware for some reason. 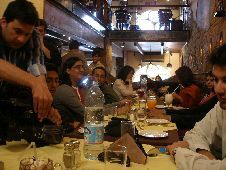 This event was blogged about by Awab, Madeeha and myself. I even had the opportunity to meet Ali Khurshid, a brilliant photo blogger from Karachi featured in the recent Time magazine issue of the ‘Person Of The Year’, in which they featured various prominent international bloggers. What I realized at the conclusion of this wonderful gathering is that even with the blanket blogspot ban enforced by the authorities, it has not made the slightest difference for these and hundreds of other bloggers as they are tenacious as ever and even more committed to promoting blogging in Pakistan, which is a very good thing. And finally, I would like to mention, that I recently re-launched my own blog, with an extremely loud whimper, rather than a bang, as my chosen wordpress theme turned evil on me and I had to experience design hell and exorcise the demons to get everything back in order. Sorry to hear you are still waiting for your visa but glad to know that you had a great time in Pakistan instead! Nice Pakistani Blog. Keep it up. Great to have you back on here, doing all the heavy lifting for your fellow Pakistani bloggers! And it was definitely loads of fun at that meet. Great finally meeting so many of the people one runs into online!